»Daimlerstraße 38«. The fox photos are the result of a pseudo-scientific research project about biology and geography in an industrial waste land. Tue Greenfort collected garbage to construct the photo trap for observing the foxes he discovered in that area. The animals were lured by a sausage. 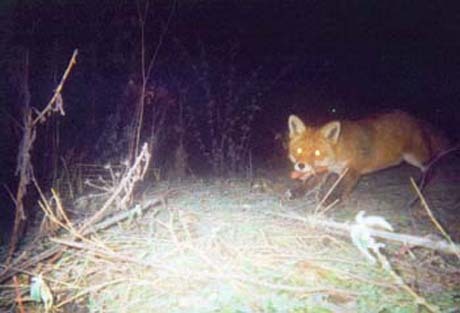 When the fox bit into the bait, it activated the camera connected by a cord to the sausage. One week later, the animals had learned to eat the sausage without being photographed. 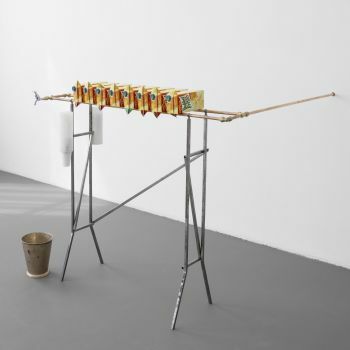 »Water Cooler« uses frozen fruit juice to cool water brought up from the point in Witte de With’s cellar where it enters the building. The intervention into the functional architecture of the institution takes Tue Greenfort’s exhibition beyond the gallery space, integrating his work into the building’s infrastruce.